I wrote this review of Bente Scheller’s book for al-Jazeera. Syrian poet Rasha Omran once told me that Bashaar al-Assad is “not a dictator, just a gangster boss.” But really he’s not even that. What he is, is what his father looked like in all those statues – one element in the managerial class, a (dysfunctional) functionary. Syria is a dictatorship which lacks an efficient dictator. Hafez al-Assad – the father – was an entirely different matter. Born in a dirt-floor shack, he clawed his way to the top by brute cunning, deft flexibility, and strategic intelligence. The careful manipulation of sectarian tensions in order to divide and rule was one of his key strategies, yet he was also attentive to building alliances with rural Sunnis and the urban bourgeoisie – both constituencies now alienated by his son. Bashaar’s great innovation was supposedly economic reform. In practice this meant an unpleasant marriage of neoliberalism with crony capitalism. It succeeded in making his cousin Rami Makhlouf the richest man in the country. The poor, meanwhile, became much poorer, the social infrastructure crumbled, and unemployment continued to climb. The thesis of former German diplomat Bente Scheller’s book “The Wisdom of the Waiting Game” is that the Syrian regime’s approach to its current existential crisis follows a “narrow path consistent with previous experience,” and she focuses on foreign policy to make this point. When the regime found itself isolated on Iraq after the 2003 invasion, for instance, or then on Lebanon in 2005 after the assassination of Rafiq Hariri and the Syrian army’s precipitous withdrawal, it waited, refusing to change its policy, until conditions changed, its opponents were humbled, and it was brought in from the cold. In his book “The Fall of the House of Assad”, David Lesch points out that Bashaar al-Assad felt personally vindicated by these perceived policy victories, and grew in arrogance as a result. Today, with the West handing the Syrian file over to Russia, and seemingly coming round to Bashaar’s argument that Islamism poses a greater threat than his genocidal dictatorship, it looks (for now at least) as if the refusal to budge is again paying off. The most interesting parts of Scheller’s book are not actually dedicated to foreign policy, but describe – accurately and with balance – the causes of the revolution and the nature of the regime’s response. The most direct link she’s able to posit between domestic and foreign policy is that, in both, the regime’s only abiding interest has been self-preservation. 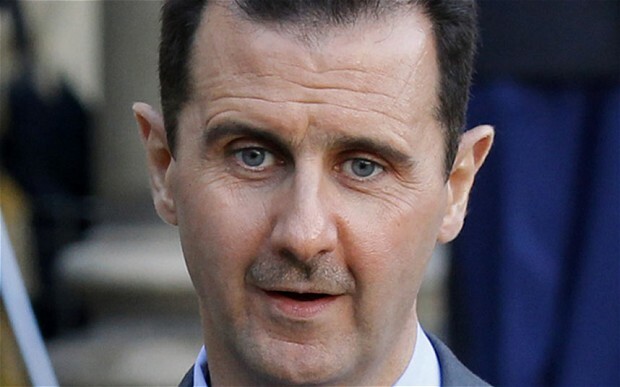 In Scheller’s words, “regime survival … defines what is perceived as a security threat.” This chimes well with the shabeeha graffiti gracing Syrian walls – “Either Assad or we burn the country.” In regime priorities, Assad always stood far above the people, the economy, the infrastructure, and even the integrity of the national territory. For both father and son, ‘Arabism’ was never anything other than a propaganda ploy. Notwithstanding its nationalist rhetoric, the regime stymied a Palestinian-leftist victory in Lebanon in 1976, before proceeding to slaughter Palestinians in the Lebanese camps. It supported Iran against Arab Iraq, and joined the US-led coalition to drive Saddam Hussain from Kuwait. All of these decisions were taken in the face of Syrian and Arab public opinion and ran counter to the regime’s own declared aims. In each case, regime-strengthening came first. To drive home her point, Scheller provides a series of illuminating summaries of relations between Syria and its neighbours since 1990. These have been characterised by Machiavellianism and self-serving relations with non-state actors (such as on-off support for the PKK’s war against Turkey, supposedly to win Kurdish rights, while Syrian Kurds remained oppressed and in many cases stateless). But despite Scheller’s argument of regime continuity from father to son, something which comes through very strongly is Bashaar al-Assad’s inability (unlike Hafez) to respond flexibly to emergent conditions. The Israeli withdrawal from Lebanon in 2000, shortly before Hafez’s death, undermined the legitimacy of Syria’s military presence there and called for a new policy. Bashaar was unable to deviate from his father’s old roadmap, however, despite its obvious irrelevance. As a result, Syria’s influence had shrunk dramatically in Lebanon and the region by 2005. Hizbullah, once a subservient client, grew to fill the vacuum (and now, according to reports from Qusair, Hizbullah even commands Syrian forces inside Syria). Syrian control of Lebanon provided a safety valve for the regime. Cross-border smuggling boosted the sclerotic economy; Syrian workers found jobs in Lebanon, easing the unemployment crisis; the regime was able to wave the banner of resistance by association with Hizbullah’s struggle against Israeli occupation, while imprisoning teenage girls who dared to blog about Palestine, and without firing a shot across the occupied Golan; even Beirut’s nightclubs offered a release for the frustrated Damascus bourgeoisie. The Lebanese case seems to prove Scheller’s contention that Syria’s foreign policy is indistinguishable from its domestic policy, that in effect there is no foreign policy, perhaps not even domestic policy, but simply, again, policies aimed at guarding the throne. Scheller’s proclaimed focus on regime rather than personality is therefore very wise. Bashaar is too insubstantial to bear the weight of responsibility for the slaughter in Syria. His name represents the collective decision making of an elite whose relations are governed by mutual fear and distrust. The composition of this elite is obscure; analysts debate the relative influence of Bashaar’s mother, or his brother Maher, or the various heads of the security agencies. What is clear is that no individual is absolutely in charge, and that there is thus no possibility of imaginative thinking breaking a failed mould. As it did in Lebanon, the regime can only follow the dead father’s script. Hafez was able to contain a Muslim Brotherhood uprising in Hama in 1982, and by killing somewhere between ten and forty thousand people, to quickly crush it. 2011 was a very different historical moment. Protesters came from every political and religious background, were spread throughout the country, and had access to cameras and the internet. Yet Bashaar still applied the techniques of the eighties, and squandered the considerable reserves of goodwill felt for him personally (if not for the wider system) by the populace. His blundering violence provoked an armed revolution from a peaceful reform movement. For Hafez al-Assad, the stubborn refusal to compromise was an occasional choice; for Bashaar’s inflexible circle, inertia became fate, a matter of inevitability. Because he was answerable to nobody, Hafez was capable of dramatic shifts. Scheller’s study starts in 1990 because this marks the collapse of the Soviet Union, a time when Assad Senior rapidly and effectively recalibrated his regional and international relationships. For now, Bashaar may be winning, but not due to his own strength or popularity, and least of all to his wisdom. For his good fortune he should thank the hard work or failures of other actors: the solid support of Russia and Iran (the latter organising his military fight-back); the West’s silent complicity; the incompetence of opposition political elites; and the growth of Salafism and the consequent fears in minority communities. If and when he does finally conquer the revolution (still an unlikely prospect), it will be a pyrrhic victory for two reasons. First, the monopoly of power and violence established by his father has been irretrievably lost. From now on the regime will be in hoc to the foreign powers and domestic sub-state militias which have rescued it. Second, with the economy, infrastructure and social cohesion of the country entirely destroyed, there will be nothing left to loot.